A few days ago it was announced that IL VOLO would be a guest of VERISSIMO, on Channel 5, an entertainment program conducted by Silvia Toffanin. And here they are, beautiful and likeable as usual, indeed, more than usual, Piero, Ignazio and Gianluca at VERISSIMO. Silvia = Today is really a fantastic episode, we are about to attend another event, they have chosen VERISSIMO to celebrate their 10 years of career, they are Ignazio, Gianluca and Piero: IL VOLO. Silvia = Welcome (kisses and hugs), these applauses for you. Piero = But they are many. Silvia = There are so many. Please make yourselves comfortable. Ignazio = Here we are. Silvia = Here we are, I did it !! Piero = We never came here. Silvia = You never came here, and I discovered some incredible things about you. Piero = How do you know these things? Silvia = Yes, that’s you. Piero = Can we leave? Ignazio = (in a deep voice) And what information do you have about me, Miss? Silvia = I have evidence and documents, we will tell all about you, we will celebrate your world career, really, because you are the Italian representatives of music, you are loved everywhere, Brazil, China, Japan, America …… where? everywhere! Piero = Now, let’s not exaggerate. Silvia = But it’s true! (applause) How many languages do you speak? Piero = One (at a time). Ignazio = Quattro (four) – English, Italian, Spanish and Sicilian (laughter). Sicilian is a language! Gianluca = I am the only Abruzzi in the middle of two Sicilians, so you can imagine what happens …..
Silvia = So in addition to singing lessons, you can also take English, Spanish lessons …..
Gianluca = We have learned traveling, it is the only way to learn to speak it well, probably. Piero = There is a lady who is watching us, who does not understand …. Silvia = Let’s talk in Italian, let’s start right from the beginning (addressed to Ignazio) since you were a baby …. Silvia = You understand, we see them all strutting, in reality they are very nice ….. then, he was two babies and you had glasses, already as a child. Piero = No, it’s that television was born thanks to me. Because when I was born, I had two ears like that (holding hands open, next to the ears, as if they were antennas), I took all the channels, in my house we never paid the TV license. Silvia = So, are you ready to start our journey? Gianluca = We can’t wait. Silvia = Go, let’s start. Voice = “Destiny always finds you”, has convinced Piero, Ignazio and Gianluca, who for all, will become IL VOLO. That fate of artists who would lead them, on stages all over the world. It was written in their DNA, from an early age. Two Sicilians, Piero and Ignazio, and an Abruzzese, Gianluca, grew up in the countryside and the sea, in their provincial villages, with humble families behind them, very tied to traditional values. Piero, sings on the sofa at home, with his grandfather Pietro, Gianluca performs in the church choir, Ignazio, instead he stays all day in front of the karaoke given to him by his father. For each of those kids, music becomes an indispensable passion. There is no doubt, Piero, Ignazio and Gianluca, who still walk different paths, have talent to sell. It is 2009 when each of them receives this call and immediately afterwards, thanks to an intuition of Roberto Cenci who already imagines them as a trio, they will find themselves for the first time really singing together “O SOLE MIO”. Gianluca = I don’t deny that I was moved. Silvia = You’re moved . Gianluca = Yes, because he said a word, which is THE TALENT. Because unfortunately, sometimes, there are people who are talented, but are not lucky enough to be able to express it, meeting the right people. We met, there, so everything happened so fast, therefore, we are privileged. All we want to do though, even if we go against the tide, surely singing a different music, from what our peers sing, is that we want to be an example to young people, to our peers, that is, to try to …… (applause , Gianluca is visibly moved) … ….. try to always be yourself, to believe in your dreams, but above all, it means that perhaps, going against the current at times, can win, and we do everything to try to get there in people’s hearts. Silvia = And you, you are a very positive example, a good story, yours. Piero = Look, we don’t do anything in particular, many people tell us “But you are successful abroad, you do so much abroad.” In reality our success is due to the music we sing, the music that is part of the our tradition, of the Italian tradition, and that is what the foreigners of Italy love. Silvia = You have started to have contact with music, more or less all of them around the age of three, thanks to the grandparents and thanks to a father. You thanks to grandfather. (Piero). Piero = Yes, thanks to my grandfather. Little did you say we grew up in the mountains and the sea, I grew up in the countryside with my grandfather, because during the summer season, I used to spend it there. Ignazio = In a big city. Piero = A small village, Naro, in the province of Agrigento, to which I am really attached (sorry, he clears its throat). My grandfather is a blind person, and he discovered my voice, he wrote songs. Then, thanks to the patience of my father, who never gave up … I met them (Ignazio and Gianluca …. Piero has a hoarse voice). Silvia = You are the one who has the most tattoos of all, or am I wrong? Silvia = Is it true? Ignazio = Yes, I’m a bit of a rebellious soul, I’m a little rock and roll. Silvia = Did you write “BORN TO ROCK” on your body? Ignazio = Would you like to know it !!! (laughter), I wrote it here, on the arm. Silvia = So you alone, you approached the music. Ignazio = Yes, because, I explained to you that my family has Sicilian origins, I was born in Bologna, I stayed in the bedroom with the keyboard they had given to my sister, and on that keyboard there was the musical base of “La donna è mobile”and I was in the room singing this opera, inventing the words about Pavarotti. Silvia = And how did your “La donna è mobile” go by Pavarotti? Piero = But I’ve never heard this version !! Silvia = Today we only tell the truth, today new things come out. And you (Gianluca) are the one who left the stage at the age of 11, in a panic, because you didn’t remember the song anymore …. Gianluca = Yes, because I sang in a choir, I didn’t remember the song, I didn’t remember the text and I ran away. We were in the center of Roseto, on the seafront, there was a lot of people, we were performing with the choir, I was singing with a little girl, I forget the text, I look at her, I start to cry and run away, and I go to hug my mother, who was practically in the crowd. She turned red, I remember very well. I was always a little instinctive, but ……. Piero = It also happened to us to forget the words. In a concert in Locarno, it was the opening of the summer tour, we had to sing “TOUS LES VISAGES DE L’AMOUR”, a French song by C. Aznavour. We haven’t been singing this song for about a year. He continues (Gianluca) with his text and then I ….. Tous les visages de l’amour ….. Tous les visages de l’ amour …. Tous les visages de l’amour…. (everyone laughs) .They start laughing and I said “Help me, sing you.”, we sang 3.15 minutes of song, always saying the title: “Tous les visage de l’amour” …. we all forgot the words !! Ignazio = No, you forgot the words. He (referring to Gianluca) forgets the words and what does he do? It is not that he is silent or remembers the words …. he says “Ignazio” (and makes the gesture of passing the microphone) ….. to me ??? Gianluca = Now I want to say that there is an artist that I have always appreciated, besides Bocelli, who has been my idol since I was a child, and then we also had the honor of singing with him, right here in Milan. This artist is Alex Baroni (Italian singer, unfortunately died in an accident with his motorbike). His story moves me every time, I remember as a child, I recorded a record at home, with friends, and I always sang his songs: “Cambiare”, “La voce della Luna”, “Onde”, I was 11- 12 years old, I sang his songs, even in the choir, there were some solo parts, and I always sang the songs of Alex Baroni, and every time moved me, even listening to my “white” voice, from when I was little and I sang his songs. So I wanted to say this thing. Silvia = You are the most shy of all, or you have been the shyest. Gianluca = I still am, I am moved when I do certain interviews ……. apart from that it is a pleasure to be here, because I follow you, we follow you, you manage to get into people’s hearts with these interviews, I want congratulate you, really. Silvia = Okay, we’re leaving ….. they don’t deserve us. Silvia = Come on, sorry, Gianluca wants to be nice …..
Ignazio (with a deep voice) Silvia, your gaze penetrates my mind and makes me feel surreal emotions ….. (Silvia laughs amused) …. I must say that I was struck by how intelligent you are …. Gianluca = Do you understand what I have to bear? Silvia = But how can you survive? Ignazio = No, how can we survive !! Gianluca = The romantic soul, they don’t understand it. Silvia = They don’t understand it. Then 2009, because we are here to celebrate your 10 years, dear Ignazio, 10 years of career flown …. Ignazio = Fly … why are we IL VOLO (THE FLIGHT)? Silvia = I made the joke without realizing it, (laughter) no oh well, it’s wonderful this joke I made. Gianluca = Here it ends badly. Ignazio = How much do we still have? Half an hour? Let’s do an hour. Silvia = So, your career has flown in 10 years, and it all started in 2009 with the program TI LASCIO UNA CANZONE, with Antonella Clerici and the first song you sang is O SOLE MIO, you want to sing a piece for us ? Gianluca = But we wanted to make you “GRANDE AMORE”? Silvia = “GRANDE AMORE” is the one with which you won by returning to that stage, Sanremo 2015. Silvia = Which one do you want to give us? Silvia = It was 2009, exactly 10 years ago, you called yourself THE TRIO. Piero = But we didn’t even know what we called ourselves. Gianluca = Before we were THE TRYO, then IL TRIO, in fact we went to Sanremo in 2010, the presenter was Antonella Clerici and IL TRIO was written there. Ignazio = In fact, we had changed name, because in America THE TRYO has a pronunciation that in Italy ….. is not the case. Silvia = And so you became IL VOLO. Gianluca = Actually few people know it, but it was also to recall VOLARE, which as a word is famous throughout the world, therefore IL VOLO, VOLARE, a metaphorical name. Piero = The reality is that our first contract was with an American record company, Universal, and they wanted a short and simple name to remember, but above all in Italian, so in the beginning we thought LA SCALA. Gianluca = No, LA SCALA no. Silvia = And in any case IL VOLO was born. Voice = No goal is so far away when you have the strength to pursue your dreams. They start singing together in 2010, going on stage like THE TRYO, but those three boys, with an extraordinary talent, will soon become a phenomenon with a prophetic name, IL VOLO. 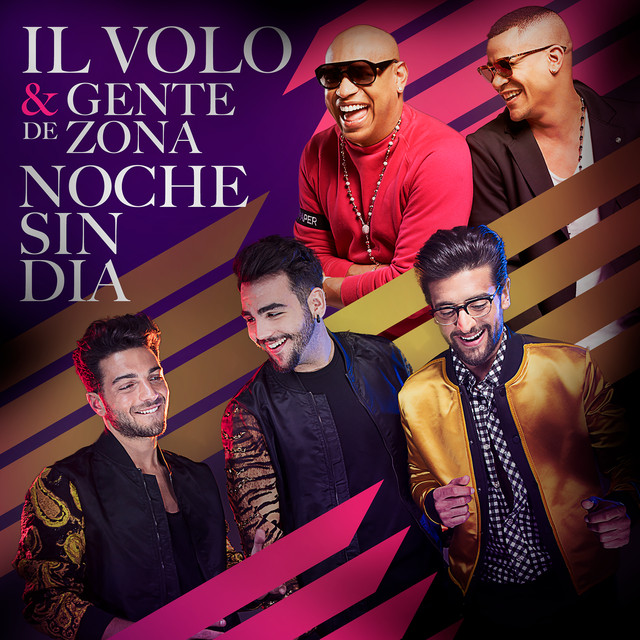 IL VOLO, they are also immediately called by the great Quincy Jones, to record, with over 80 international artists, the song “WE ARE THE WORLD” for Haiti, and immediately afterwards their first international tour kicks off. They sing in the Senate of the Republic, in front of Pope Francis, even in the evocative Basilica of Assisi. They play duets with the greats, from Placido Domingo to Anastasia, from Laura Pausini to Andrea Bocelli. After the success of the 2013 South-American tour, two years later they finally get on the Sanremo stage, and with the track of “GRANDE AMORE”, they win. The success is unstoppable and after the victory, the albums Sanremo “GRANDE AMORE” and “L’AMORE SI MUOVE”, are published all over the world, in a few days, they will reach the top of all the international rankings. The three boys, raised with an artistic awareness that consecrates them among the most beautiful voices of Italian music, bring the NOTTE MAGICA tour to the world, a tribute to the three tenors, Pavarotti, Domingo and Carreras. They have recently given birth to their sixth album, MUSICA, along with the song “MUSICA CHE RESTA”, arriving on the podium at Sanremo 2019. Today they are preparing to celebrate their 10-year career with a new tour in Italy and abroad, ready, as always, to fly. Silvia = This year you have returned to Sanremo. You arrived third, with a beautiful song, written between the authors, also by Gianna Nannini and unfortunately, I don’t know if you feel like talking about it, but I think it is right to say it, the last night, some journalists from the press room, while it was decreeing the winner, they really used words, I don’t even know how to say them, because they really made a bad figure, even compared to the whole category, using expressions, horrendous and unrepeatable insults, the video runs on the internet, we’ll never do it see why it’s really a terrible thing to you. I find it a shameful thing, because journalists are there to judge and not to do these insults. Silvia = So Gianluca, we can say that you have grown a little quickly, you have not known the adolescence of your peers. You became very famous at 14-15 years old. Ignazio = Girl or girls? Silvia = Girl said. He said girl. Gianluca = It got out of my mouth. Silvia = Did he say it on purpose Piero? Piero = I don’t know …..
Gianluca = I also have to tell you that she looks like you …. Silvia = What is the name of this girl. Gianluca = Now you want to know too much. Silvia = But is it Italian? Gianluca = Yes, of course. Piero = If he returns home and the girl is there, of course she is Italian. Silvia = Your eyes shine when you talk about her. Gianluca = It’s nice, isn’t it? Being able to sing for someone, and think of someone. Silvia = So do you sing for her? Silvia = He sings for his girlfriend and also for the audience. Gianluca = Absolutely, you saw what happened, in an instant I lost a band of audience. Piero = Fortunately we are three. At IL VOLO concerts …. Piero = At our concerts, I find audiences of all ages. Some people catch a slice of the public, some another. Gianluca has more girls, I have mothers …..
Ignazio = Wait, I go to rest homes. Silvia = Grandmothers, you are for grandmothers. Ignazio = How aggressive you are. Silvia = So we discovered that among you, there is a girlfriend. Gianluca = It escaped me, I didn’t want to say it, sometimes they advise not to say everything, in the entertainment world. Ignazio = They say that engaged people are the most courted, you know? Gianluca = It will be so, I don’t know. Silvia = Are you a psychologist today? Silvia = You have been to Good Morning America, to American Idol, you have opened 12 Barbra Streisand concerts, you have been in the most important programs of the US and not only that, right? And then I’ll show you this video. Voice = 2011, IL VOLO conquering America. They will be the first Italian singers to sign a contract directly with an American record company. First in Miami, then in Los Angeles, they are hosted by the most important TV programs, such as American Idol, which makes them known to the general public. Among the international stars who notice them, there’s Britney Spears who after seeing them on the show, throws a tweet where she writes all her appreciation for the young tenors. “We would like to embrace, one by one, all the people in front of us, and who have made us become what we are today”. Their hybrid style, between lyric and pop sounds, conquers the world and in 2012, even Barbra Streisand, calls them on her tour. They have also recently been chosen to represent Italy at the Friendship Gala between Italy and China. Three boys, who besides their worldwide success, have kept the simplicity of their soul of timid and simple children, linked to their families. Silvia = For you, even. Everyone standing. How beautiful! Piero = Seeing these images …..
Piero = Seeing all these images, we would like to say something important. All this is not just our merit, our team is behind us, the merit also goes to the record company, but above all to a person who has been with us for 10 years and we can call him our mentor, it’s our manager Michele Torpedine, thanks to him, we managed to do this. Silvia = You are very humble, and it is a beautiful thing about you, that you have kept humility, you are really sweet, right Ignazio? I think I made a mistake, because you didn’t open Barbra’s concerts, you really sang with her, in her concerts. Have you met the older ones, from Lady Gaga, Barbra Streisand, Quincy Jones, who is it that fascinated you the most? Piero = Barbra …. no, personally Placido Domingo, sorry. Gianluca = Have you thought about it? Piero = I grew up listening to the Three Tenors, to be close to Placido Domindo, I think it was the greatest emotion of my life, besides the one with Pope Francis. Gianluca = You must know that we, we have three different personalities, three different voices, also thanks to this CD just come out, which is MUSICA, that we can convey what are our single vocalisms, and we are really happy. For example there is a cover of “A CHI MI DICE”, maybe no one expects it, we made a beautiful version. Silvia = By Tiziano Ferro. Gianluca = Yes, of Tiziano Ferro, who also published a post, saying he was very happy with this. Ignazio = And like magic, here is the CD. Silvia = Here is the CD, how did you know that ??? Piero = We give you a dedication. Silvia = Give me a dedication. (Begins a series of sentences on which Piero, Ignazio and Gianluca do not agree and so decide to write “A Silvia” which is the beginning of a famous Italian poem). Silvia = This CD will go around the world. Gianluca = You are officially invited to a concert, wherever you want, even to more than one, if you want, you can always follow us. Piero = In July we will sing in Rome, in Taormina, it will be a summer tour of 17 concerts and then there will also be a winter tour. Gianluca = At the Verona Arena we will close the summer tour in September. Silvia = This for Italy and then you will be for the world. Gianluca = In May we will be in Japan. Gianluca = We light up immense. Piero = Write “To Silvia, with much esteem, IL VOLO.” is enough. Silvia = Here … but sorry he wanted to be kind. Piero = But she is married, has two children. Ignazio = But what does it mean, if she is married you can’t give her a compliment? Ignazio = A Silvia, the most splendid woman in the world. Gianluca = You are special. Silvia = Let’s finish singing? Ignazio = We write “A Silvia” is a poem, she is a poem. Silvia = That is sweet. What do you say, let’s close singing? I would have thought of a song, since you go around the world, I would have thought of the song “IL MONDO”. Piero = So we close like this? Ignazio = Are we closing? I just want to tell you one thing, can I? Come closer. Sometimes for an artist, to show his inner side is very difficult, so from IL VOLO, I want to say thank you, because in this program, you give the opportunity to show the most intimate part of a person. So thank you for inviting us, it was an honor for us. Silvia = You are three fantastic guys, see you on tour and you deserve all the success. Piero, Ignazio and Gianluca, in this interview you were wonderful. We all know what kind of people you are, and in this program, you have given reconfirmation of this, but there was no need, because we all know that you are wonderful boys. Silvia, you are a very sweet girl, who opened your heart and put our guys at ease. On one thing Piero, I disagree with you, it is true, at the beginning you had the success thanks to the beautiful Italian melodies, but this, now is just an added value to your skill, because people are also in love with you, with your way of being, as only you can be, IL VOLO. Credit to owners of all photos and video. Some of us have known IL VOLO for a long time, but many others (like me) have started to follow them after Sanremo. So, for many, Sanremo was a beginning, but those beautiful days of February 2015, how exactly did they take place? Sanremo started on February 10th, but IL VOLO entered the scene from the second evening, on February 11th, Gianluca’s birthday. Perhaps not everyone knows that in those days SORRISI E CANZONI, an Italian journal of music and gossip, entrusted to Piero, Ignazio and Gianluca, a video-diary, that is a daily appointment, where they had to make a video and tell their emotions. I found on Vimeo, all the videos, with the translations, so you can read what our kids said in those days. The guys on the red carpet at Sanremo. And here’s the fantastic first night, the first time that GRANDE AMORE is heard by an audience, by the public of Sanremo!! The reaction of the public is simply fantastic, the guys very excited, Gianluca with tears in his eyes ….. a success! 12 February, the boys are excited about their first performance. It’s the evening of the covers. 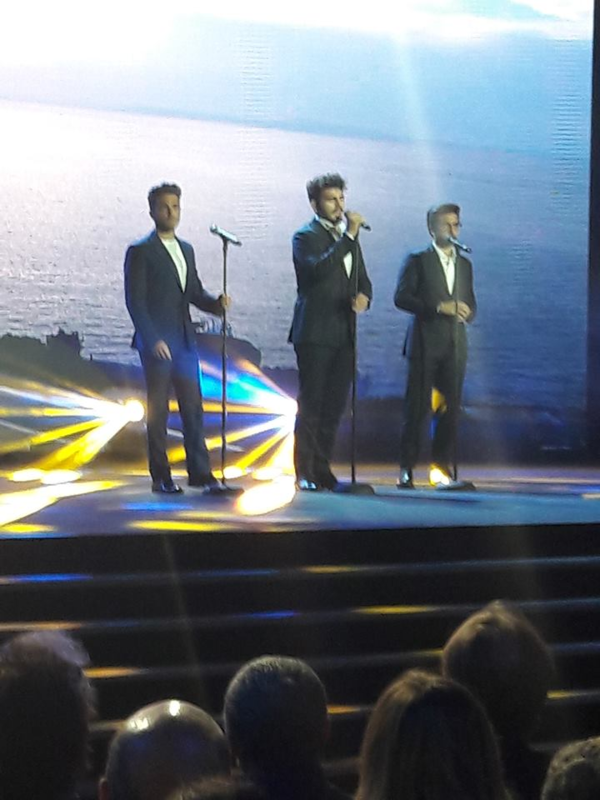 Second evening, IL VOLO sings ANCORA. February 13 third night, the boys will still sing GRANDE AMORE and there will be the first eliminations. What about, again fantastic reaction of the public that call their name aloud. The guys are very excited with Carlo Conti (the presenter) who keeps reminding them that they are competing. February 14th, last day of the video-diary and last evening of Sanremo. Great last evening, each singer receives a video message from a supporter and for IL VOLO there is Placido Domingo. And here we are at the final moment, the ranking has been said, the first three positions are missing, Carlo Conti calls on the stage all three singers. The guys, immediately after the victory, the kisses and hugs and the pose for the cover of SORRISI E CANZONI for the victory of Sanremo. I do not know if all of you had seen all this, I myself was not looking at Sanremo, I turned channel only at the time of victory, I saw the delivery of the trophy but I had not yet heard the beautiful GRANDE AMORE, and when I heard it, it was immediately great love !!! I hope this reconstruction has thrilled you, as it has excited me, and you find that the video diary made by Piero Ignazio and Gianluca has shown them to us as they are really . . . three simple and nice guys, our three boys of IL VOLO . Credit to owners of all videos and photo. I am not going to waste any time talking because this speaks all on its own. Enjoy! Gina expressed a desire for clarified voting procedures and what it all means when it comes to the San Remo Music Festival next month. A very logical request, because I’ve tried to read up on how the festival works and had to speak with two knowledgeable people before I think I’ve finally got it down. And I’ve always thought of myself as a reasonably intelligent person (nobody comment on that!). In a simple form, San Remo is indeed a competition in which music is being judged in several categories, but it’s also a bit of a popularity contest in all of Italy and Europe for the artists involved. When the time comes, it will be a 60% to 40% split between the judges and the fans respectively, so all of the TV shows and appearances that involve Il Volo are to create and maintain buzz about them going into the competition. The competition itself is full of little competitions within the big one. Most notably (in the category Il Volo is competing in), there is the competition between artists in how they interpret the music given to them, as well as a competition between the song writers and their songs–which are being performed for the first time ever by the artist assigned to it. As noted in a previous article about this competition, Il Volo will be singing, “Grande Amore,” written by Francesco Boccia. [Invited to San Remo in 2015] In this scenario, if Il Volo is declared the winner of their category, so will Francesco, as the writer of the song. To win the competition would give Il Volo another level of prestige and the chance to compete–if they choose–in the Eurovision Competition. In this poll, you may vote once per hour, for twenty-four votes in a twenty-four hour period. I hope this answers your questions. As more information is found, we will bring it to you as quickly as possible. Thank you LiJoy (conferring with Athina for clarification) and Bev Olsen for your help!